We are primarily an education and training company providing courses in the area of animal care, training and behaviour. We present the most up to date and evidence based study materials and have strict policies in place to protect learners who study with us. 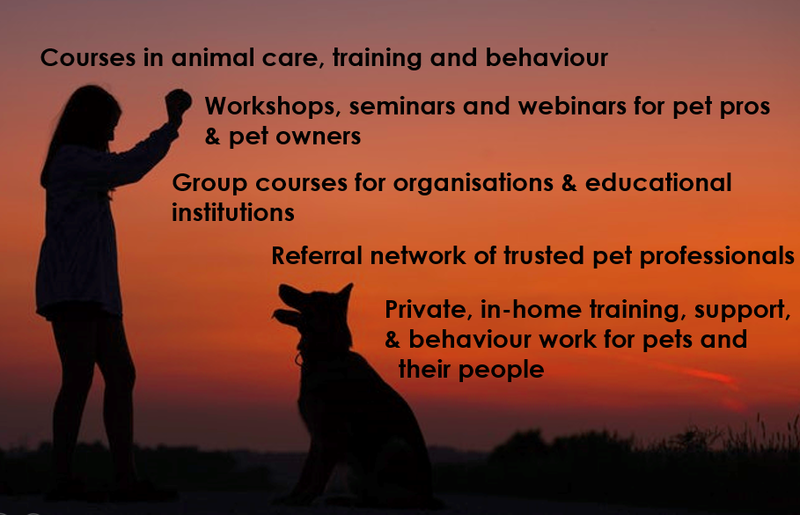 We offer dog training and behaviour services to the public and a variety of organisations including the veterinary community and rescue/rehoming organisations and charities. Our behaviour consultation is by veterinary referral and we work with a number of vets around the country. We work with rescue and rehoming organisations providing safe, effective advice and training to their staff and volunteers. We support a number of assistance dog organisations through the provision of bespoke training and education courses. We work with commercial and public organisations whose staff come in contact with dogs as part of their normal working duties, including meter readers, couriers and postal workers, dog wardens and dog pound personnel. We are passionate about animal welfare and make it a priority to be informed in all areas of animal health and welfare. Where necessary we make submissions to government working groups in the area of animal welfare legislation and regulations. We provide support to institutes of further education who deliver animal science and care qualifications nationwide. Support is provided in the form of workshops, talks and courses.